When their Uncle Lancelot shows up at their house one day flying a giant hot air balloon called the Belladonna, the three Dollybutt children - Emma, Ivan, and Conrad - are completely shocked. They are even more surprised when Lancelot proposes that they join him for a year-long journey around the world to look for his brother, Perceval, who might be in need of rescuing. After getting permission from their mother, and assuring her that it will be worth missing school to learn what Perceval can teach them on their journey the three kids board the Belladonna and take to the skies. Over the next year, they travel from their home in England, to Africa, Australia, North America, and South America, where, thanks to a magical powder administered by Lancelot they are able to talk with the animals they meet and take notes on how they think and feel as well as how they live. When I was in third grade, my teacher put together a unit for my class based on The Fantastic Flying Journey. As the book was read aloud to us, we worked in teams to accomplish different tasks associated with the regions the characters were visiting. We also ate a trail mix called gorp, which I remember had a lot of coconut and chocolate chips in it. The following summer, when I was shopping with my mom, I saw a hardcover edition of the book in an outlet bookstore. Based on how much I had enjoyed that unit in school, we purchased the book. For some reason, though, from that day to this, I never touched it! Not even once. 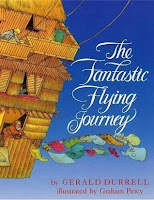 When I chose the "books you loved in childhood" focus for the Old School Kidlit Reading Challenge, this was actually the first book that came to mind. I was curious to see whether it would hold up for me after 25 years. For the most part, on this reading, I found this book pretty boring. I think my fascination with it must have had more to do with how much I liked my teacher and the classroom activities she developed to accompany the book than with the book itself. Though there is something of a plot, the book is really more about conveying information about animals and their habitats (and in some cases, the way humans have destroyed them) than following characters through a story that changes them in some way. It is definitely better-written than something like the Magic Tree House series, and the artwork is very attractive, but there wasn't much to it for an adult who already knows basic animal facts. I do think this book will be useful for homeschooling purposes. While it's not much fun to read straight through just for pleasure, the Dollybutts' experiences do provide a very palatable way to learn about the geography of different parts of the world and the different varieties of animals that live there. It is a bit disappointing that Asia is not represented at all, and neither is Antarctica. At first I thought it might be because they were covered in a sequel, but the only companion book is a time travel story about dinosaurs (The Fantastic Dinosaur Adventure, 1989), so it appears these continents were just left out. All in all, I will always cherish the memories of that wonderful third grade lesson based on this book, but I probably won't read the book again anytime soon.